It is refreshing to see the new Sustainability Statement in its report which is a requirement from Bursa Malaysia for locally listed companies. Nevertheless, the statement did not show sufficient details. As per the current rule, a detailed disclosure will only need to be published in financial year ended 2018 onwards. Its balance sheet, in my opinion is healthy. It is in a net cash position, and its share price is trading very close to its net asset value of about RM0.85. From its latest 2017 income statement, its profitability margins -- profit before tax and profit after tax -- have declined from 17% and 15% respectively in 2016 to 12% in 2017. Refer Table 1: Income Statement extract. As disclosed in its recent annual report, Hevea's external environment remains challenging as it is faced with a shortage of foreign workers, higher raw material costs, and the appreciation of the ringgit against the US dollar. Despite the challenging environment, its financial results are commendable as it manages to record a double-digit profit after-tax margin. The challenge for the company is whether it can continue to maintain a profit margin in its high teens in coming years. Its cash flow is still relatively healthy as it generated about RM85 million from its operating activities in 2017. The company invested RM67 million to expand its business operations, and RM42 million was distributed as dividends to its shareholders. Refer to Table 2: Cash Flow Statement extract below. 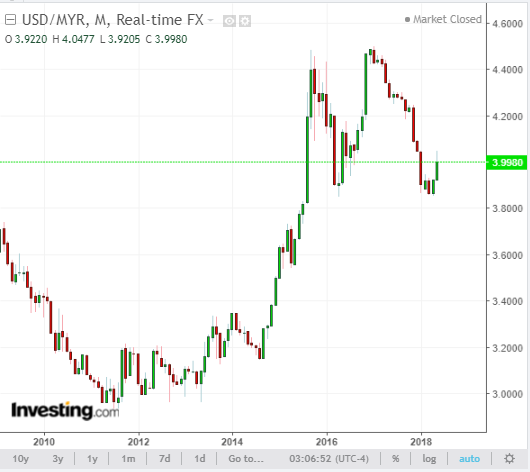 Looking at the USD/MYR chart, the appreciation of the MYR against the USD seems to have found its support at around 3.8500. As the US unwinds its quantitative easing, it is anticipated that the US Federal Reserve will increase interest rates at least twice before the end of the year. This will induce US dollar assets to return back to the US and will depress other currency markets such as Malaysia. Everything remains equal, it is likely that the MYR will weaken against the dollar. As about 90% of its products are exported, it is expected that its bottom line will be positively impacted. At RM0.88, Hevea is trading below its intrinsic value and its net asset value. Considering the contribution of revenue and profits from its new 7.7 acre ready-to-assemble factory and king oyster mushroom farm in 2018 and beyond, I would expect some top-line and bottom-line growth. As no one can accurately predict the direction of USD, the fundamentals of the company and track record of its management team are the best indicators of future performance. From my review of this company, I note that its current management team has a proven track record of delivering sustained success; this is evident in its past financials. Therefore, I rate this company a BUY at its current share price. Please read the Disclaimer page before deciding to buy or sell this stock. Wow, this is a good write up!